Always listening, Slotland.com has incorporated player feedback in a new and improved version of one of their most popular games, Four Cast. The game has been re-worked to enable players to make it through four rounds for each game. Maximum payout has been increased as well and players can now win up to 100X their wager if they are able to predict the suit and value of all four cards dealt by the video poker style dealer. 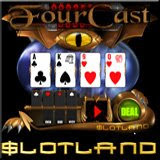 Apart from the famous progressive jackpot tied to all of their 15 unique slot machines, FourCast has one of the biggest payouts available at Slotland.com. Players can win as much as $8000 on a $20 bet. 100 X can become 400% if there’s a joker in the hand. Players hit Slotland’s famous progressive jackpot if they correctly predict all four cards and the cards are in four different suits. Slotland.com is an online casino that features only one-of-a-kind slot machines and video poker games. But Four Cast is actually neither. It’s a card prediction game that combines the thrills of cards and the quick, easy play of spinning slots in an exciting new game that challenges players’ psychic powers. All of Slotland’s games are “instant play” so there’s no downloading. And none of them are available at any other online casino. However, many of them are also available on mobile phones at Slotland’s mobile games site, wap.Slotland.com. All of Slotland.com’s web and mobile games are tied into the same progressive jackpot that is hit for well over six figures about every six weeks. Slotland.com is one of the most trusted online gambling sites and has loyal players around the world, including the United States.